Oh, you want more do you? Well, I'll try to collect my thoughts a bit. At the present, they feel rather jumbled. 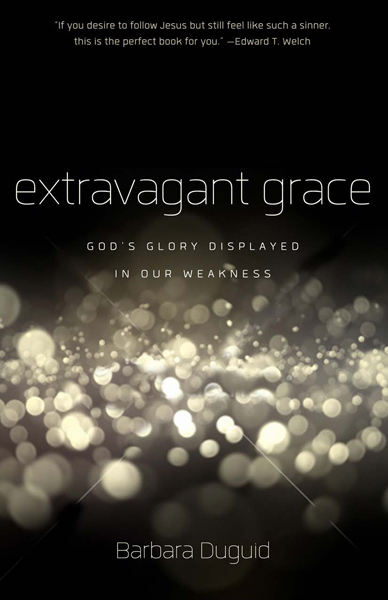 I've just completed reading Extravagant Grace despite my wariness at the title. What I mean by that is that I have seen so many recent titles come out on the subject of grace these days that I'm thinking we're forgetting the fact that we're not supposed to sin. We do sin, of course, and so grace does abound as Duguid points out but I'm a little hesitant about our approach and our general obsession with this subject of late. It's not like grace has never existed in previous years or generations before so why the focus these days? When I look around at Christendom, I really don't see many strict rules or guidelines enforcing the law; rather, when I look around I see a lot of lenience with regards to the law. These being my misgivings, I liked the subtitle of this new release from P&R Publishing, which is, God's Glory Displayed in Our Weakness. I nestled down into the couch cushions with a provided copy of Extravagant Grace and immediately got lost in the message which Duguid aspires to bring to the church. This is? You will sin. You do sin. You are a sinner. You will sin still and for as long as you are alive on this earth. But there is grace in spite of your sin which you have been committing and will continue to commit. Frequently we Christians (*cough* like myself *cough*) believe and act as if once you become a Christian you really are supposed to stop sinning. It is very true that when you become a Christian your desires are to be submitted to the Lord and that change, by necessity and by fact, will occur. However, Duguid points out that not every Christian is going to mature at the same rate or at the same levels and there is grace for every point in between. It is a struggle for me to accept and/or acknowledge that fact that Christians can be weak, even though I know myself to be exactly that. I have a personality that comes down hard on sins which are visible to my naked eye. If you think I have ever come down hard on you, you can (and maybe should) only imagine how hard I come down on myself. I detest sin in myself and yet I go on doing some things which drive me absolutely out of my own mind. WHY do I keep sinning when I have been saved and redeemed? Instead of kicking myself, Duguid would suggest that I acknowledge that God knew I was going to sin (and might go on doing so) but that there is grace which will see me and anyone I affect with my behaviors through. He will give me grace to continue on whether or not I stop my "bad habits" or continue on with them. He will, can and does work for His glory in my weakness and displays His great strength so that I will understand that without Him all is futile. My sinful heart should pray for the desire to repent of the sins and I should ask for the Holy Spirit's help in striving to conquer the "old man" within. But above all I must understand that there is no obedience unless God gives me the grace and the help to obey. Everything starts and finishes with God and that is why we take note of the concept of grace because it is everything to us. "If decreasing the total number of sins that I committed were God's primary objective, He would have kept me out of the wilderness. However, he led me into the wilderness to reveal my sin to me because seeing my sin is good for me and brings Him glory. It is good for us to see our sin, because when we do, our Savior becomes dearer to us. When we are standing tall and strong we do not tend to look at Christ - we don't need Him. But when we fall flat on our faces, overcome with sin and weakness, there is nowhere else for us to look but to the One who has died our death and lived the life we should have lived. God loves broken and contrite hearts, and we don't acquire those by living the victorious Christian life. Extravagant Grace is not a book about forgetting the law and loving the sinner in spite of themselves. It is about loving the sinner in spite of themselves in the sense that we each of us know that we are sin-filled creatures ourselves, each grateful that no one knows the full depths of our depravity. But God does know. And thankfully there is grace which promises a sure future in Christ, regardless of our own frailty. We can rely on Christ to help us work on our obedience to Him and He is pleased with our efforts. However, He is also pleased with us if we fail, because He is not surprised by the fact that we would (and do). This is expected. The fact that our failure is expected is not license to do as we please but it should result on an acknowledgement of a gift that we have undeservedly been given. It is almost too overwhelming to contemplate and yet Duguid helps one to come to the cusp of understanding. I have never viewed grace in the way that she presented it. If I am being honest, (oh bother), I suppose I have always prided myself on the fact that God got such a good "catch" in me. I am so very willing to obey after all . . . (except when I flat out do not want to). He must be simply delighted in me! Many thanks to P&R Publishing for providing a copy of this book to me in order to facilitate this review. All opinions expressed are my own (should anyone out there really doubt it!). Great news! P&R Publishing has also offered to give away THREE copies of Extravagant Grace to three of you! Care to win? Simply leave a comment below including a valid e-mail address. This contest is open to US Residents only and will be open through Tuesday, September 24th. God's grace is indeed extravagant! I think I need a bit of that, too! It sounds like a lot of good stuff in this one. I used to think the way you did, that we could "avoid" sin. Part of me still thinks that way. The other part of me, thanks to someone in our church, now understands that every decision we make can be influenced by our sinful nature- by selfishness, desire for security, prioritizing our own families over God's other children, etc. This viewpoint is especially useful to me when making a decision such as a job decision. Yes, supporting our family (including potentially parents and truly needy extended relatives) is a desirable goal so having a job is a good thing. But WHICH job is influenced by godly as well as ungodly motives. "We all have mixed motives, Taia, because we are sinful creatures." Sounds like a good one to check out! Looks like a great book- thank you! Definitely sounds like a message I need to hear/read! mamahagan (at) gmail (dot) com! I'm thankful that our church is very direct and convicting in their preaching on this topic - it IS good for us to see our sin and once again flee to the cross! I, too, get tired of seeing grace, grace, grace everywhere, sometimes at the expense of "letting sin abound". It would be nice to read a balanced approach. I'd love to read this. Grasping the concept of grace has been a life-long struggle. I DO care to win. I would love to read this. It sounds very interesting. I'd like a chance to read it. Thanks for having the giveaway. I have to echo your thoughts on Grace. I tend to get a little weary many times when I hear it used. I'm really hard on myself with sin, though, so I'd love to read this for a middle ground, since it is one you recommend. Grace is something to be celebrated, and not everyone has been exposed to the concept so additional sources to spread and explain the message of grace is a wonderful thing! I would love to read this! OH! Kristin told me about this book, and I have to admit, I had the same reaction you did when I heard the title. But I planned on giving it a try. Thanks for confirming my decision!